If they are standing next to one another, it’s an easy ID as Whooping Cranes are the tallest bird we have in North America. They are also overall completely white, while Sandhill cranes are smaller and generally grey overall (often with some rust color) with a white patch on their cheek. But its not always so simple! Both birds have red patches on their crown, but in different kinds of light, Sandhill Cranes may appear white, and immature Whooping Cranes have a lot of rusty feathers. So getting the size right can be very important! Also listen to their calls, which is also a great way to make the correct ID. 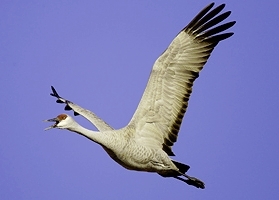 Want to learn more about Sandhill Cranes in Nebraska? Check out this blog post from photographer and sound recordist, Stan Tekeila.